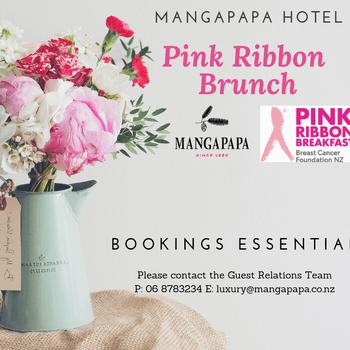 We are raising money for the Breast Cancer Foundation NZ with a beautiful Pink Ribbon Brunch. 1 in 9 women are diagnosed with breast cancer every year. This means at Mangapapa we will all know someone who is or will be effected by this and we would like to show our support. Our event will be fun, delicious but also help bring awareness about this terrible disease and raise some money for the outstanding charity. The brunch will be made up of long sharing tables with a large selection of sweet and savory breakfast treats, a glass of pink bubbles plus tea or coffee. Tickets are $65 with $15 of every ticket being donated to the Breast Cancer Foundation. Bookings are essential through the Guest Relations Team on 06 878 3234 or luxury@mangapapa.co.nz. A luxury raffle prize donated by Mangapapa Hotel will be up for grabs with all proceeds going to the charity. Pink Ribbon Brunch We are raising money for the Breast Cancer Foundation NZ with a beautiful Pink Ribbon Brunch.